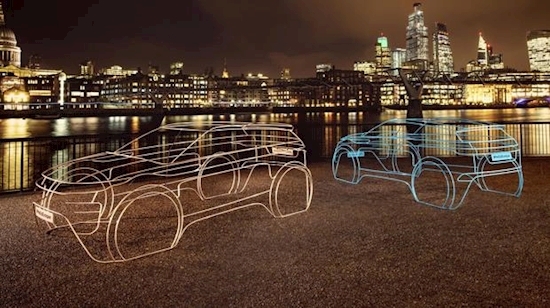 London - Given the rate of inflation these days you’d be forgiven for thinking that this was a new stripped down entry-level model from Land Rover, but this is actually a teaser campaign for the all-new Range Rover Evoque that’s set to be revealed on November 22. These full scale wire sculptures were inspired by modernist design philosophy and are now popping up all over London. Sure, they don’t give all of the newcomer’s design details away, but they do show that the 2019 Evoque will have an evolutionary shape. The front end retains its slim headlight and grille design, but the lower airdam is significantly larger - something no doubt inspired by all of today’s ‘two-tier’ designs - while the tail end sees a taillight structure extending across the rear end, reminding us of the Velar. Details remain thin at the moment, but the second-gen Evoque is reportedly built around a heavily revised version of the current platform and there are rumours of a new 1.5-litre three-cylinder base engine, which would eventually be mated to an electric motor. Expect the cabin electronics to receive a thorough overhaul too. Hard as it is to believe, the current Evoque has been around since 2010 - such a head-turner it was at the time. It has also proved instrumental in the company’s resurgence this decade, with global sales exceeding 750 000 units.